Born March 21, 1976 in Essex County, Ontario, Jeff Lemire is a Canadian illustrator, cartoonist, and writer. He is best known for his early self-published work entitled Lost Dogs (2005; reprinted in 2012) and for his graphic novel trilogy Essex County (2009). Most recently, Lemire is known for illustrating Gord Downie’s Secret Path (2016). Lemire’s work as a writer and illustrator has made him one of Canada’s most highly acclaimed graphic novelists. His graphic novel trilogy collectively entitled Essex County (2009), a fictionalized tale set in the author’s hometown, was named one of the Essential Canadian Novels of the Decade by Canada Reads in 2011. The first volume of this trilogy (Tales from the Farm) received the American Library Association’s Alex Award in 2008. Lemire has also been nominated for several prestigious awards, including an Ignatz Award in 2007 (which is given in recognition of excellence in cartooning). Lemire was raised in Essex County, Ontario. Though Lemire briefly attended film school as a young adult, he preferred to spend his time honing his cartooning skills. He did not send any of this early work to publishers, opting to instead use this time to perfect his craft. Lemire currently lives and works in Toronto, Ontario. Downie, Gord. (2016). Statement by Gord Downie. Retrieved from secretpath.ca. 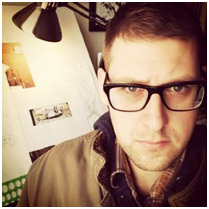 Jeff Lemire (n.d.). DC Comics. Retrieved from DC Comics. Learn, J. R. (2014). Jeff Lemire. Canadian Geographic, 134 (2), 21. Lemire, Jeff. (2005; 2012). Lost dogs. Marietta, Ga.: Top Shelf Productions. Lemire, Jeff. (2007). Ghost stories. Marietta, Ga.: Top Shelf. Lemire, Jeff. (2007). Tales from the farm. Marietta, Ga.: Top Shelf. Lemire, Jeff. (2008). The country nurse. Atlanta: Top Shelf. Lemire, Jeff. (2012). The underwater welder. Atlanta: Top Shelf Productions. Lemire, Jeff. (2009). Essex county. Atlanta: Top Shelf Productions. Lemire, Jeff. (2014). Trillium. New York: DC Comics/Vertigo. Mansbridge, P. (2016). The most emotional thing I’ve ever done: Jeff Lemire on illustrating Gord Downie’s Secret Path. National (CBC Television). Moran, R.J.R. (2011). Jeff Lemire. The Canadian Encyclopedia. Retrieved November 5, 2016.